"Face the facts, some things never come together / Parallel lines, running on forever..."
Ah, yes, the many faces of Todd Rundgren. He is certainly a true rock and roll renaissance men, and unfortunately he is probably more of an acquired taste for most. He's got a fairly loyal fanbase, and he has of late morphed into an awkwardly odd techno persona that is not as innately appealing as when he is in his more direct pop phase. In my estimation (for what it's worth) he is in league with Elvis (Costello, not the dead guy), and that's pretty high praise considering how reverently I worship Mr. Costello. Rundgren is a truly underrated (among the masses, at least) producer, performer, songwriter, and when it comes to crafting pop hooks, he is simply one of the best. This latest offering from Image resurrects a 1990 concert from Japan, in which Rundgren performs with a whopping eleven-piece band during a tour to promote his largely forgotten Nearly Human album. Almost half of the songs are from that 1989 release, with a smattering of assorted solo Todd stuff, and even a Utopia song thrown in for good measure. Rundgren is in his pop troubadour mode here, and the bulk of the songs are performed with the smooth finesse of a Vegas showman. He only straps on a guitar a couple of times (including a wonderfully simple acoustic version of Love of the Common Man), with some requisite minor flashy fretwork during the venerable Love in Action. Rundgren is backed by a solid eleven-piece band, which is a far cry from his comparatively stripped down Utopia tours, or even the power trio of Todd Rundgren: Live In San Francisco. The band features frequent collaborators: keyboardist Vince Welnick of The Tubes, guitarist Lyle Workman and bassist Larry Tagg. A trio of female background singers, finely choreographed and bedecked in TIGHT dresses include the drool-worthy Jenny Muldaur, just in case you're interested. There isn't really any between song chatter here, and the production features a number of your standard rock concert camera angles. The backing band gets plenty of coverage, especially drummer Michael Urbano and the aforementioned background singers. Image Transfer Review: The 1.33:1 full-frame transfer from Image here suffers that bane of many a concert disc, which is the dreaded red spotlight bloom. The closeups of Rundgren look clean enough, but his touring band is bathed in those hot red lights that tend to reveal a fair amount of grain. That's about the only real beef I had with the image transfer of what is essentially a strictly by-the-numbers concert disc. 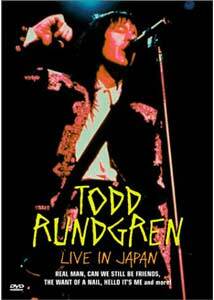 Audio Transfer Review: Image has included two audio options as part of Todd Rundgren: Live In Japan, in Dolby Digital 5.1 and 2.0 Stereo. Would it shock you to learn that the 5.1 blows the doors of the simple 2.0 stereo track? Well, it shouldn't, pal. The 5.1 is obviously a vast improvement over the fidelity limitations of the stereo track, and it gives the songs much more depth and dimension. High ends are not as crisp as I prefer, and the rear channels only provide faint audience sounds. Even though this is a slightly mellow Todd, this disc sounds very good cranked up. Extras Review: Nothing to speak of in the extras column. The disc is cut into nineteen chapters, one for each of the seventeen songs, plus one each for the opening and closing credit sequence. This isn't raucous, loud, guitar-solo Todd. Instead, it's the kindler, gentler, nearly radio-friendly Todd performing a well-balanced set of his material; I call 'em hits, but that's probably just me. If you're a fan, get this one NOW.